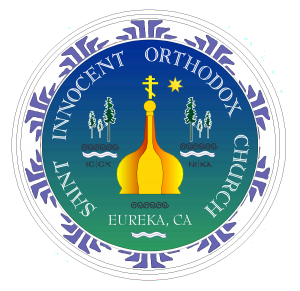 It would seem that the Orthodox Christian community in Eureka should and could be the first one in town. Think about it: our temple (place of worship or “church” in common language) on F street is the oldest in Eureka, built in 1883. But Eureka was settled in 1850! So places of worship were built quite a while after settlers arrived from the East (as in East Coast of the USA and Western / Northern Europe). So let’s start even earlier: 1836. That year, a man sails past Humboldt Bay, on his way from Alaska (called Russian America at the time) to Fort Ross. This man is John Veniaminov, the pastor of the Church of Sitka, Alaska. He will be forever remembered as Saint Innocent of Alaska, the Enlightener and Friend of the Native Tribes of the great Northern. 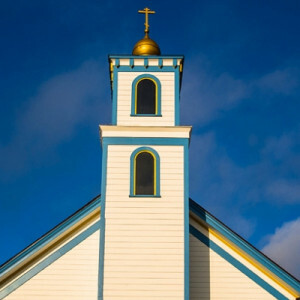 Few people realize that there was an Orthodox Christian community (and Church) on the Northern California Coast, as early as 1823. It was nearby, but it wasn’t quite Eureka. We now return to 1850. That year, Eureka is settled by new immigrants, mostly coming from Western Europe and Scandinavia. At the same time, the European / Russian settlers are retreating. In 1850, St Innocent – the first bishop of Alaska and the great Pacific Northwest – decides to move his cathedral to Siberia. Eventually, he will be called to become the Metropolitan bishop of Moscow, and died in 1879. Four years later, a church is built in Eureka that will bear his name and remember his amazing missionary work. In fact, the people who came to settle Eureka did not come from historically Orthodox lands. The temple on “F street” was built for the Congregational community, and it was abandoned to be demolished after World War II. But another group (Apostolic Faith) came forward and took over “the first church,” until CalTrans bought to built a highway over it. Yet, that project did not come to pass, and CalTrans put the old church on the market. In the 1990s, there were many Orthodox Christians in town, but no formal parish had been established. By God’s providence, a missionary set things in motion and organized the group; the building was purchased, and a permanent priest was assigned as the Orthodox community became affiliated to the Orthodox Church in America which Saint Innocent had worked so hard to establish. Today, we are a diverse and vibrant community, counting many young families and living the tremendous to be the expression of the historic and apostolic Church in Eureka. As Saint Innocent himself taught and lived, the Orthodox Christian faith is for everyone seeking God, Truth, and the calling of Eternal Life in Christ Jesus. We invite you to join us and learn more about Christianity itself: Orthodox Christianity. The Church is not a building. In fact, Orthodox Christians usually call their place of worship “temple.” So what is the Church? What did Jesus mean when he said: “Upon this rock I will build my church” (Matthew 16:18). 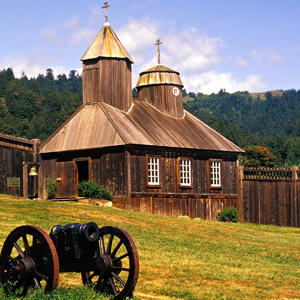 Learn more about Fort Ross and how “Eastern Orthodox Christianity” met with Roman Catholicism in the Spanish missions of the Bay Area in 1836.